AGSIW hosted a conversation with the institute's chair, Ambassador Frank G. Wisner, who recently returned from meetings with European and Iranian interlocutors. Between President Donald J. Trump’s announcement withdrawing from the nuclear deal and Secretary of State Mike Pompeo’s outline of major new sanctions and other measures, the administration’s newly outlined U.S. approach to Iran is probably its most consequential international policy decision. What is the likelihood of success for this new U.S. approach, and what about potential pitfalls? How will this evolving policy toward Iran affect Washington’s relations with Gulf Arab countries, European allies, and other major powers such as India, Russia, and China? 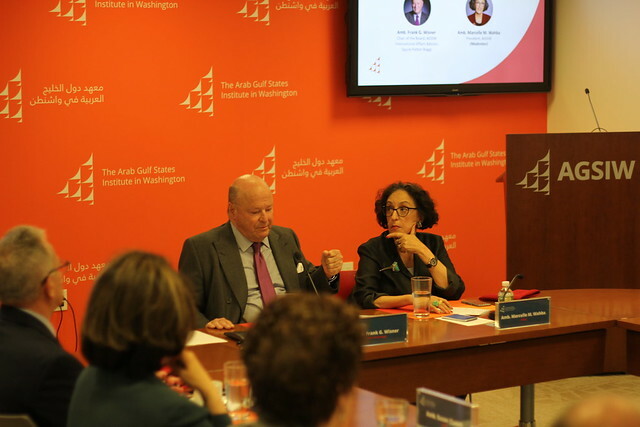 AGSIW hosted a conversation with the institute’s chair, Ambassador Frank G. Wisner, who recently returned from meetings with European and Iranian interlocutors.